While it wasn't quite the workhorse that Rare was during the Nintendo 64 era, Factor 5 developed a handful of third-party games that arguably matched Nintendo's own efforts in terms of technical quality. The studio had a knack for getting underneath the hood of the system and exploiting its raw power to create fascinating visual experiences. Its first effort on the N64, Star Wars: Rogue Squadron, was a considerable success and praised by critics for its visual prowess. Given how superb the title's visuals were, you'd think it impossible for Factor 5 to top it. 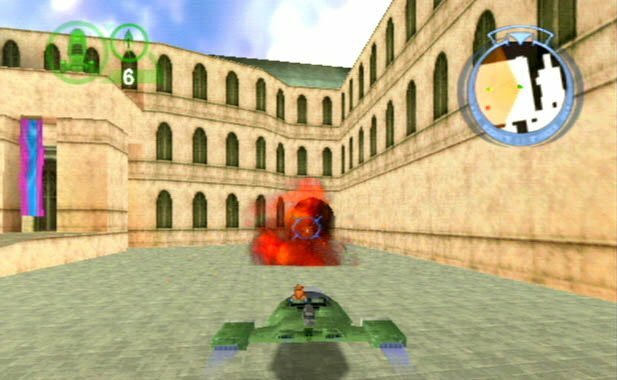 Nevertheless, in late 2000 (early 2001 in Europe), Star Wars Episode I: Battle for Naboo — a spiritual successor to Rogue Squadron — was released. 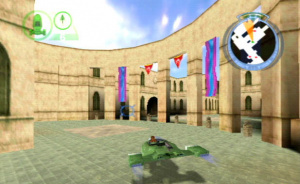 Developed in collaboration with LucasArts, the title features some of the best visual and audio work seen in an N64 game. Set during the events of Star Wars Episode I: The Phantom Menace, the game puts you in control of Gavyn Sykes, a Lieutenant in Naboo's Royal Security Forces during the time of the Trade Federation invasion. Up against an overwhelming force, Sykes' story sees him building a resistance movement and taking the fight to the enemy. This actually works in the game's favour, as it doesn't get bogged down in any of the silliness that plagued the film. The focus here is on all-out action and this is something that Battle for Naboo easily achieves. The fact that Jar Jar Binks is seen getting crushed by the N64 logo during the game's intro screen speaks volumes about what to expect. 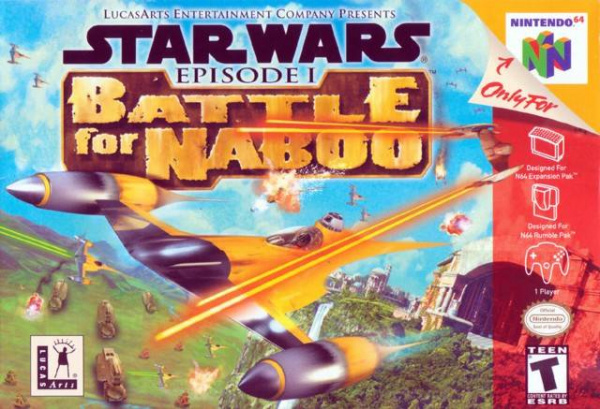 It's important to note that Battle for Naboo isn't just a re-skin of Rogue Squadron. In fact, despite being quite similar to its predecessor in terms of gameplay, Battle for Naboo doesn't actually use the same game engine. 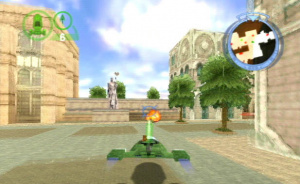 The end result is a game that is one of the most technically advanced games for the N64. The title makes good use of the system's 4MB Expansion Pak, featuring a whopping 640x480 high-resolution mode and farther draw distance than most other N64 games. Moreover, certain levels, such as Naboo Bayou and Hutt's Retreat, feature weather effects such as rain and snow. The most impressive thing about this is that the frame rate is in no way affected. Albeit, the effects look quite basic by today's standards, but this was pretty advanced for the time and proved that the system still had a few tricks up its sleeves as it was coming towards the end of its lifespan. Audio is another area where Battle for Naboo impresses. Factor 5 was able to overcome the limited storage of the Nintendo 64 cartridge — in this instance, a mere 32MB — to include full voice-over work. Granted, it's a little unclear at times, but that partly seems to be the result of the voices being modify to sound like they're being heard via a radio. Nevertheless, it adds a great deal of production value to the experience and Factor 5's efforts should be commended. Throughout the game's 15 missions, you switch between a selection of land, sea and air vehicles. This mixture provides a varied experience, although there are a few issues. For example, controlling the land vehicles can feel a little cumbersome in some of the less open environments. 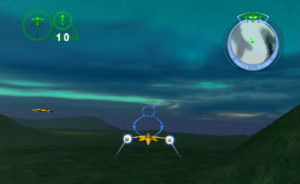 Moreover, two of the game's missions take place in orbit above Naboo, and as the game doesn't feature a three-dimensional map, the entire experience becomes very clumsy (this was later addressed in Star Wars Rogue Squadron II: Rogue Leader). Lastly, some vehicles just feel redundant. The Police Cruiser, for example, is a ship you get near the start of the game, but there's simply no use for it once you get your hands on the far superior Naboo Starfighter. In a way, having more missions early in the game that could have centred around the lesser crafts would have likely helped build up a greater sense of progression. Nevertheless, one of the game's best features is to switch vehicles mid-mission. In certain stages it's a requirement in order to progress, but in one particular instance you're given the option to choose based on preference. This changes the entire structure of the mission, adding a great deal of replay value. It's just a shame that more portions weren't designed with this multiple approach concept in mind. Despite this, most of the missions in Battle for Naboo are extremely fun. During the battle segments, there's usually always an impressive number of enemies and allies on-screen at the same time. Some of the mission objectives are rather testing, too, especially when it's possible to fail right up to the last moment. With that said, the majority of missions require one or two attempts at the most. As a result, Battle for Naboo is a woefully short experience and can easily be completed within an afternoon. A multiplayer mode would have been a nice addition, but given that the game already pushes the Nintendo 64 to its limits, it's not hard to understand why this wasn't included. Star Wars Episode I: Battle for Naboo is a work of technical wizardry: It sounds and looks fantastic for its era, to the point that it is clearly one of the Nintendo 64's visual tour de forces. Being able to use a variety of land, sea and air vehicles makes for an interesting gameplay experience, although there are a few issues when it comes to control. It may be short, but it approaches the source material in an intelligent manner, focusing on what makes Star Wars the space opera epic it is: the battles. The final product is a game that does justice to both the N64 and the franchise. I played the heck out of this and Rogue Squadron when I was a kid. Easily one of my favorite N64 games. Always hoped they'd come to the virtual console, but with Disney owning Star Wars now I don't have my hopes up now. Damn I miss the N64 era. Gaming and the future of gaming was an exciting time, when you look at the next gen there is nothing but cynicism. It was a good game and all, but the Controller Configuration was TERRIBLE!!! You HAD to use all the Spokes of the Controller to play the game. The Middle with the JoyStick and Z button. The Left with the D-Pad and L button. The Right with the 4 C, R and B/A buttons. I played Rogue Squadron a ton and loved it very much. Unfortunately, I never had the opportunity to play Battle for Naboo. I was really hoping these games would make it over to the Virtual Console. Nope. Star Wars titles on Super NES, N64, and GameCube were instant classics, this includes the Super Star Wars Trilogy, Shadow of the Empires, Battle for Naboo, Racer, and the Rogue Squadron Trilogy. Now if only they make a Super Star Wars Trilogy of the first three episodes, that'll be awesome. Never heard of this one, but it looks amazing for the N64!!! Is this better than Rouge Squadron? I amazed at how much game these people make with such limits data. How on earth does a game like Zelda: OoT fit on 16mb. "Factor 5 developed a handful of third-party games that arguably matched Nintendo's own efforts in terms of technical quality." Matched? I think Factor 5's games exceeded Nintendo's in terms of technical quality. Nintendo never developed a game that ran in 640 x 480 resolution with near-CD quality audio that had the longest draw distance in any N64 game I've ever seen, while maintaining a fairly steady framerate. I just played through this game again a few weeks ago. It's still good fun even though some of the later levels are way too hard. It's not as good as Rogue Squadron, but it's still fun (and the in-game commentary by the developers is a neat bonus feature). Looks fun. I have never actually played this title. Factor 5 really new knew how to make the N64 hardware sing! Because of this game and Rogue Squadron I had to pick up Indian Jones & The Infernal Machine also by Factor 5 and for the N64. The version for the N64 was even better than the PC version. I'm a huge fan of these guys! "the effects look quite basic by today's standards"
That's one of the things I love most. For some reason I don't care much for higher polygon and texture games. I guess I'm just old school. Oh and cool game by the way. N64 is the best game system ever as it has the best games ever made. @TenEighty I'm really glad you think this! Far too often I hear people say how ugly they find N64 games - I think a lot of them still look fantastic. The vibrant colours tend to help - just look at Super Mario 64. @Scollurio Rightens? Where the hell did you hear that? And this movies tons of fun if you're drunk/ stoned. Chill. Battle for Naboo was 32MB, not 16MB. If you pulled the info from wikipedia then you should know they're wrong on this one . And what wrongs would that be? [email protected] If Disney were to make a "New Star Wars Trilogy" they would ruin it..
Basicly, everything. The "new" trilogy Lucas made was just unbearable. I'd say get back to using actual models for the spaceships and get back to that wasted look of the originals, I hated the oh-so-shiny look of everything in the new trilogy that's supposedly been in the past of the original trilogy. So many things didn't make sense, especially, the force being basicly a blood disease?! At that moment I knew it can only get worse. They redeemed themselves with the last 40 minutes of episode III though. @misterquin I don't drink and I don't "stone" so I was left with a horrible prequel! I used to stay up all night playing this as a kid. I was a Star Wars nut lol. Didn't matter if it was good or bad.